A common concern shared by teachers across the disciplines is that our tasks do not prepare students for success in the current, innovation-based economy. One skill becoming increasingly relevant is the ability to crowd-source funding for projects using video and social media. With this in mind, a summative assessment was designed for my Grade 10 / MYP 5 Individuals & Societies students, in which the format of a ‘Kickstarter’ campaign was used to debate the morality of dropping the Atomic Bomb on Hiroshima. Students could crowd-source funding for the Manhattan Project, if they supported the decision to drop the bomb. Alternatively, they could choose to crowd-source funding for the removal of the Enola Gay exhibit at the Air & Space Museum. Below you will find the MYP Unit Plan, a video created by students, and the Summative description. Hope you find these resources useful! Understanding Urbanisation through Project Based Learning. Author James WilsonPosted on August 26, 2015 April 15, 2016 Categories Student WorkLeave a comment on Understanding Urbanisation through Project Based Learning. August 7th, 2014. Madrid. Thirteen zombie attacks reported near the city center. The following day, Toledo declares a state of emergency in response to six zombie attacks. You are the chief advisor to The Center for Disease Control. A colour-coded alert needs to be issued to the various regions of Spain, based on the likelihood that zombies will strike these regions next. Accurate alerts will require you to make use of Spain’s topographic and climate data, in addition to understanding the physical geography, and cultural attractions. More importantly, you will need to know how different cities are connected–high-speed trains? Busy highways? Rivers?–as this knowledge will reveal the routes zombies may travel to fulfil their ghastly ambitions. Zombie-based geography is the brain-child of David Hunter. The scenario described above (in abbreviated form) is how I adapted David’s ideas to meet my own student’s needs, personalities, and objectives. An upcoming school trip to Spain inspired the choice of location. We focused on ‘Communication’ as the Approach to Learning (ATL), by learning how to use a green-screen to create a video. We also communicated our understanding of spatial analysis through geographic tools (maps). Having students video-record the process of their decision-making while solving problems turned out to be an excellent practice in metacognition. We all know students learn from solving problems, but there is not much attention given to student’s explaining the process by which the solution was achieved. Those of you who use games to promote learning may consider a similar ‘think-aloud’ practice, as it is sometimes hard to access what exactly is being learned. This sort of project also has a lot of potential for ESL instruction, as it motivates students to learn, and develops visual and oral skills of communication. Here are two student samples that I think illustrate how learning can be creative, effective., and fun… Hope you enjoy! 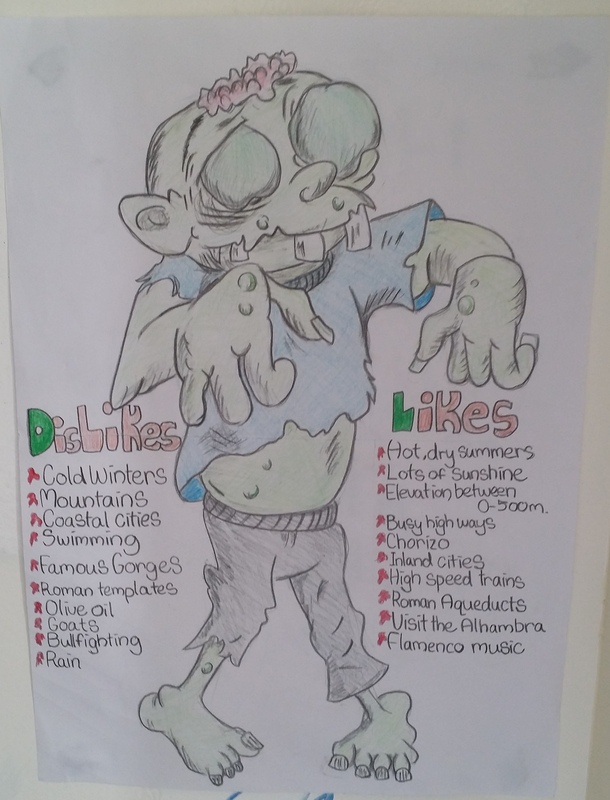 Author James WilsonPosted on October 30, 2014 January 28, 2016 Categories Student Work2 Comments on Zombie-based Geography?